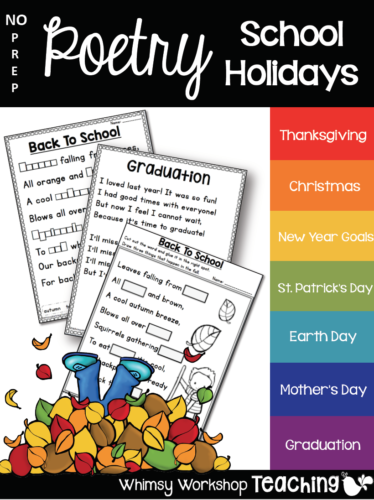 There are 6 poetry sets bundled together with topics such as seasons, holidays, growth mindset, friendship and more! 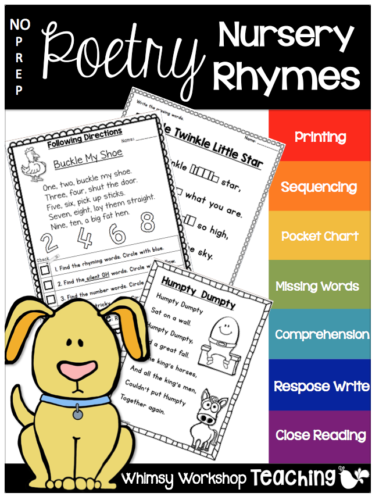 Each poem has no-prep activities to choose from – perfect for whole group, small group, independent literacy centers, or home practice. This bundle of poems addresses building perseverance resilience with poems such as “I Won’t Give Up”, “I Can’t Do It – YET” and “Making Mistakes”. It also explores dealing with feelings of anxiety and how to be a good friend to others. 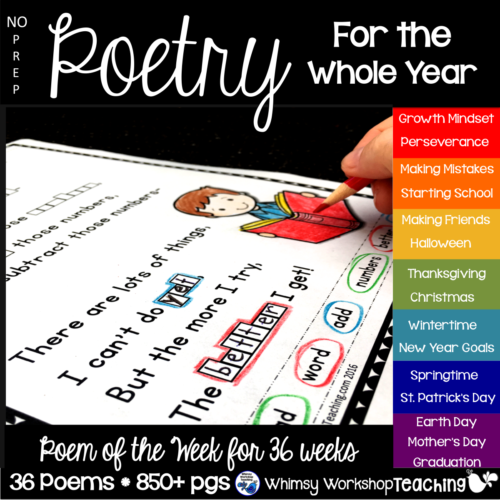 As we go from one holiday to the next in primary classrooms, it’s so great to have poems and activities for each of them at your fingertips! This collection of 8 holiday poems also has over 10 no prep activities each! Nursery rhymes are wonderful way to introduce poetry to young children. Many of the simple rhymes are already familiar which adds to engagement. This set has 100 pages of activities divided into 6 poems. 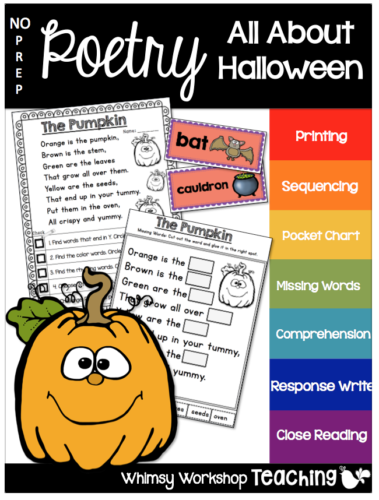 This set of Halloween Poetry is interactive and engaging while practicing core skills such as close reading, comparing, sequencing, and more. These 6 poems are not so scary, and have 10 different activities each. 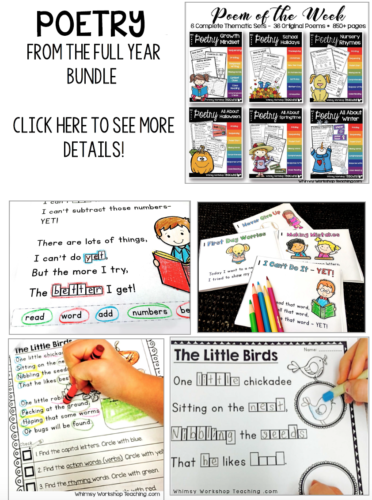 Also included are vocabulary cards, interactive notebook activities, and pocket chart words to print and use right away. 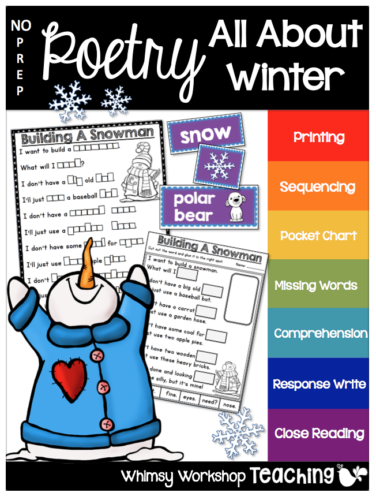 This set of Winter Poetry is interactive and engaging while practicing core skills such as close reading, comparing, sequencing, and more. These 6 poems have 10 different activities each. Also included are vocabulary cards, interactive notebook activities, and pocket chart words to print and use right away. Interactive Poetry Spring has six springtime poems to practice reading and writing, as well as theme vocabulary. Each of the poems has colorful word cards, pocket chart words to print and use right away, and several engaging printables or mini-books. This is a different kind of integrated poetry program – students draw as they read the directions embedded within each cute poem. 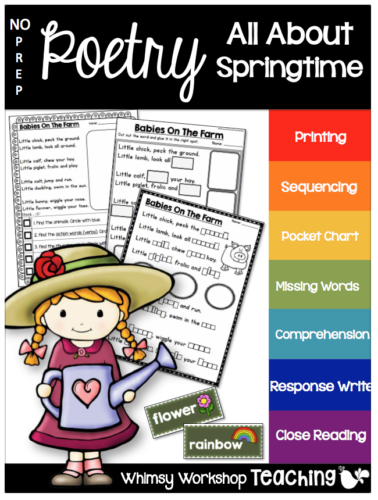 Each of the six Spring-themed poems has 8 different activities to complete. A great way to practice following directions; also practices rhyming, parts of speech, compound words, self-editing and more. Spring themes explore life cycles, weather and much more.